The Department of Hockey Analytics crunched some numbers and discovered some things to keep an eye on in the NHL this season. Predictions made at the beginning of a season are the toughest to make. 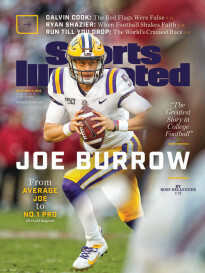 As players change teams, new coaches are brought in, and new systems are implemented, it’s difficult to forecast how these things will play out. That said, there are certain patterns in the data from past seasons that hold true and can give some insight into what lies ahead. 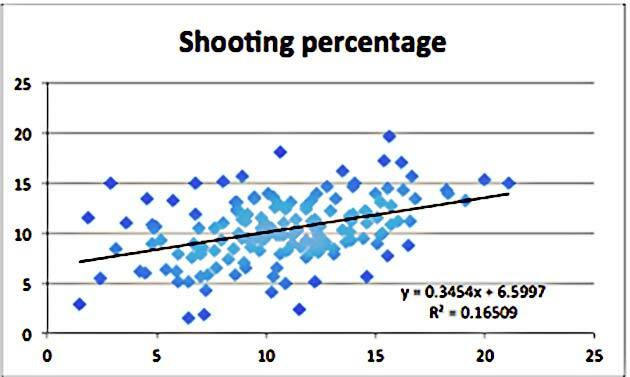 For individual players, shot attempts tend to be relatively stable from year to year. Consider all forwards who played at least 500 minutes in the NHL during each of the past two seasons (data from war-on-ice.com). Along the horizontal axis is a player’s shots per 60 minutes of play during the 2013-14 season, and on the vertical axis is the same player’s shots per 60 in 2014-15. While there is some variance, the points are clustered around the trend line and the slope of the line is relatively close to one, which shows that there is a very strong correlation from year to year, and, other than a few outliers, the correlation holds for just about all players. A player’s shooting percentage, however, shows way more year-to-year variation. In the next graph, a player’s shooting percentage in 2013-14 is presented on the horizontal axis, and that same player’s shooting percentage in 2014-15 is on the vertical axis. Not only are the points scattered more liberally around the trendline, the trend is considerably flatter, meaning that there is a tendency for regression–that is, other than a handful of true “snipers” at the top right of the graph, or fourth-liners with cement hands at the bottom left, players with high shooting percentages one season have a tendency to post a lower one in the next, while players with a low shooting percentage one season will have a tendency to increase their shooting percentage in the next. With these pretty reliable principles in mind, here are some predictions for the upcoming season, two of which have some interesting twists. Over the last three seasons Ovechkin has been remarkably consistent in both his shot generation and conversion rates. His shooting percentages over the past three seasons were 14.5% in 2012-13, 13.2% in 2013-14, and 13.4% in 2014-15. During these same three seasons, he generated 13.1, 14.3 and 14.2 shots per 60 minutes of play, respectively, while playing 21.0, 20.8 and 20.6 minutes per game. At some point, age will catch up with Ovechkin (he’s 30), but there’s no reason to suspect that it will be a factor this season, and he seems like a lock to come close to his average performance over the past three seasons which would yield 394 shots across 82 games and a shooting percentage of 13.7% for 54 goals. How many Biscuits will Phil Kessel Basket? And when we say “biscuits” we’re not referring to his notorious disdain of fitness and nutrition, we’re talkin’ good old twine-bulging, top shelf, wicked-wrister, Phil Kessel goals. Last season we advised (maybe implored or even begged would be more accurate) the Penguins to trade for Kessel to create what would seem to be an unstoppable combination of Sidney Crosby (or Evgeni Malkin) with one of the best triggermen in the game. Now that they have finally seen the light, how can we expect Kessel’s production to change relative to his productive yet underachieving years in Toronto? Our approach is to use the natural template that the Penguins have already given us: Patric Hornqvist’s performance when he came over to Pittsburgh before last season. The comparison isn’t perfect, but it’s a good start. Hornqvist’s shot attempts per game with Nashville were almost the same as Kessel’s in Toronto, and once he got to Pittsburgh, Hornqvist played most of his minutes with Crosby or Malkin at center, as we expect will Kessel. We first measured what happened to Hornqvist’s numbers when he came over from Nashville. His shot attempts per 60 minutes (in 5-on 5-play) increased only marginally, by about 1.8%. But his “true” shooting percentage (the percentage of all shot attempts that result in goals–not just shots on net that result in goals) increased from 4.60% to 5.71%—an increase of 24.1% (stats courtesy of stats.hockeyanalytics.com). Pretty amazing, but playing alongside Sid the Kid will do that. We then assumed that Kessel’s numbers would increase by the same amounts. This is a strong assumption, but we think reasonable enough as a starting point. If that happens, Kessel’s shot attempts per 60 will increase to 18.22 (slightly lower than Hornqvist’s 18.45 last season) and his true shooting percentage will increase from 6.3% to 7.78%. If Kessel plays about 14.5 minutes (5-on-5) per game—which is about half way between how much he played in Toronto and what Hornqvist played last season in Pittsburgh—then Kessel will attempt 361 shots and score 28 goals at 5-on-5. Of course, we can’t forget power play goals. We’re not convinced that shot metrics tell the story on power plays, especially for teams with the talent and creativity of the Penguins, so we took the absolute difference in power play success between the Pens and Leafs over the last three years (22.2% vs 18.0%) and assumed Kessel’s goal scoring would increase by the same amount. If anything, this seems conservative, considering Kessel will likely be the triggerman on the most talented power play unit in the league. But with that conservative assumption, our calculations show Kessel netting 11.5 goals with the man advantage. That gives Kessel 39.5 goals (5-on-5 plus power play). We think this is probably low. Kessel scored 37 twice with Tyler Bozak as his center. Even accounting for the lower ice time he’ll probably get in Pittsburgh, it’s hard to believe he won’t beat those numbers by at least three goals. And 3-on-3 overtime is tailor-made for Kessel’s explosive, high speed, sniper-shot skill set. Our prediction is that Kessel will score 45 goals this season. And if he actually continues to take his fitness seriously we wouldn’t be the least bit surprised if he hits 50. For years Sharp was one of the mainstays of Chicago’s top six. Since 2008, playing primarily with Jonathan Toews and either Patrick Kane or Marian Hossa, Sharp scored between 0.9 and 1.21 goals per 60 minutes (5-on-5). But last season, playing mostly with Brad Richards or Andrew Shaw, his production crashed to just 0.55 goals per 60. What’s particularly weird is that while his goal production dropped, his shot rate actually increased and his shooting percentage dropped to the lowest of his career. Was Sharp’s drop just a function of changing linemates? That could be it as well, but Richards and Shaw aren’t slouches and, as we mentioned, Sharp’s shot rate increased, so that doesn’t quite add up either. 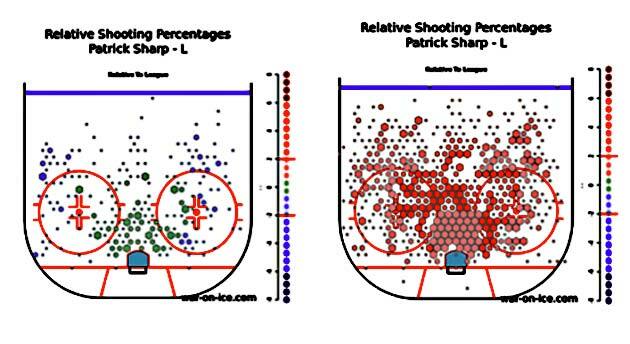 Here’s where things get really interesting: It seems that last year Sharp was used in an entirely different way offensively than he had been before. 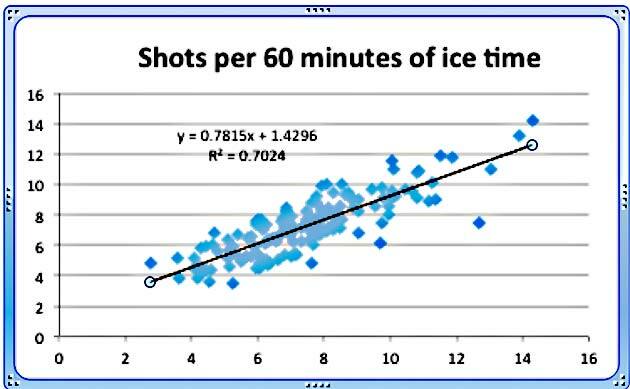 Below are “Hextally” graphs (courtesy of war-on-ice.com), which show the location on the ice from which a player takes his shots, and how his shooting percentage compares to the league average from each area. 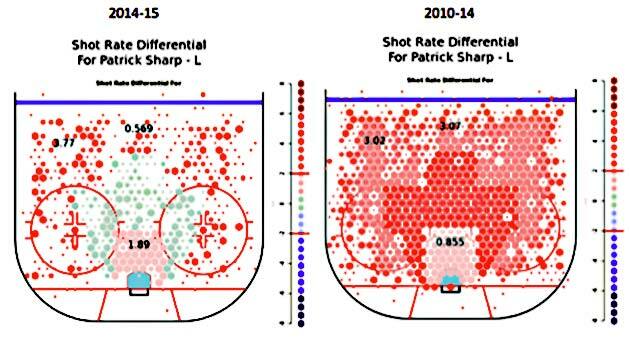 The graphs show that in Sharp’s most productive years (2010-14), he took far more shots than average from the area just outside the crease, but in the “home plate” scoring area around the goal his shooting percentage in that area was well above league average. But the graphs for 2014-15 are almost mirror images. The home plate region is green, which shows that last season Sharp was taking far fewer shots from his sweet spots, and even the ones he was taking from there weren’t finding the twine at the same rate. After an off-season trade, Sharp is now in Dallas. So the question is whether the Stars have seen what we have and can find a way to create chances in the areas where Sharp thrives. If so, while it may not be possible for him to replicate the four 30-goal seasons he had playing in his prime with some of the best linemates in the league, we should expect that he can do a lot better than last year’s disappointing 16 goal effort. Hockey is a wonderful, beautiful, exciting, complicated game. When analytics aree done right it can help reveal things that weren’t noticed before. 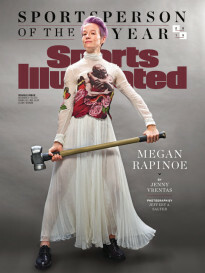 Hopefully we at the Department of Hockey Analytics will be able to do that for you over the course of this season.